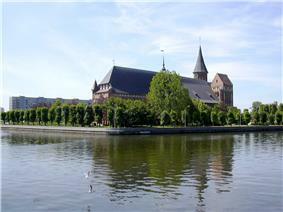 Königsberg was a port city on the south eastern corner of the Baltic Sea. It is today known as Kaliningrad. The literal meaning of Königsberg is 'King's Mountain'. 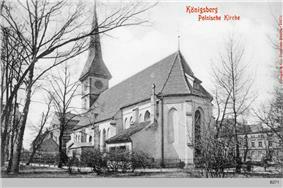 In the local Low German dialect, spoken by many of its German former inhabitants, the name was Königsbarg (pronounced ). Further names included Russian "Кёнигсберг" Old Prussian: Kunnegsgarbs, Knigsberg, Lithuanian: Karaliaučius and Polish: Królewiec. Königsberg was founded in 1255 on the site of the ancient Old Prussian settlement Twangste by the Teutonic Knights during the Northern Crusades, and was named in honour of King Ottokar II of Bohemia. A Baltic port, the city successively became the capital of their monastic state, the Duchy of Prussia (1525-1701) and East Prussia (until 1945). Königsberg remained the coronation city of the Prussian monarchy though the capital was moved to Berlin in 1701. It was the easternmost large city in Germany until it was captured by the Soviet Union on 9 April 1945, near the end of World War II. Between the thirteenth and the twentieth centuries, the inhabitants spoke predominantly German, but the multicultural city also had a profound influence on the Lithuanian and Polish cultures. The city was a publishing centre of Lutheran literature, including the first Polish translation of the New Testament, printed in the city in 1551, the first book in Lithuanian language and the first Lutheran catechism, both printed in Königsberg in 1547. Under Nazi rule, the Polish and Jewish minorities were classified as Untermensch and persecuted by the authorities. The city housed thousands of interned Jews who were forced to undertake tasks under the most deplorable conditions during the Second World War. By the end of the war, Königsberg was heavily damaged by Allied bombing in 1944 and during its siege in 1945. The city was captured and occupied by the Soviet Union. Its German population was expelled, and the city was repopulated with Russians and others from the Soviet Union. Briefly Russified as Kyonigsberg (Кёнигсберг), it was renamed "Kaliningrad" in 1946 in honour of Soviet leader Mikhail Kalinin. It is now the capital of Russia's Kaliningrad Oblast, an area completely cut off by land from the rest of Russia. During the conquest of the Prussian Sambians by the Teutonic Knights in 1255, Twangste was destroyed and replaced with a new fortress known as Conigsberg. This name meant "King's Mountain" (Latin: castrum Koningsberg, Mons Regius, Regiomontium), honoring King Ottokar II of Bohemia, who paid for the erection of the first fortress there during the Prussian Crusade. Northwest of this new Königsberg Castle arose an initial settlement, later known as Steindamm, roughly 4.5 miles (7 km) from the Vistula Lagoon. In 1454 the Prussian Confederation rebelled against the Teutonic Knights and formally asked the Polish King Casimir IV Jagiellon, to incorporate Prussia into the Kingdom of Poland as a fief. This marked the beginning of the Thirteen Years' War (1454-66) between the State of the Teutonic Order and the Crown of the Kingdom of Poland. 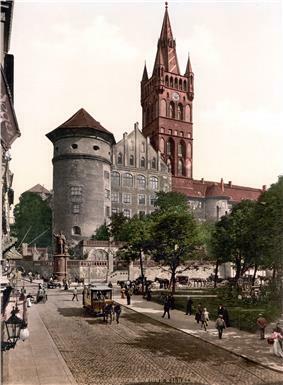 While Königsberg's three towns initially joined the rebellion, Altstadt and Löbenicht soon rejoined the Teutonic Knights and defeated Kneiphof in 1455. 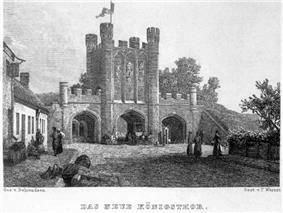 Grand Master Ludwig von Erlichshausen fled from the crusaders' capital at Castle Marienburg to Königsberg in 1457; the city's magistrate presented Erlichshausen with a barrel of beer out of compassion. When western Prussia was transferred to victorious Poland in the Second Peace of Thorn (1466), which ended the Thirteen Years' War, Königsberg became the new capital of the reduced monastic state, which became a fief of the Crown of the Polish Kingdom. The grand masters took over the quarters of the marshal. During the Polish-Teutonic War (1519–1521), Königsberg was unsuccessfully besieged by Polish forces led by Grand Crown Hetman Mikołaj Firlej. Through the preachings of the Lutheran during the Protestant Reformation. After summoning a quorum of the Knights to Königsberg, Grand Master Albert of Brandenburg (a member of the House of Hohenzollern) secularised the Teutonic Knights' remaining territories in Prussia in 1525 and converted to Lutheranism. By paying feudal homage to his uncle, King Sigismund I of Poland, Albert became the first duke of the new Duchy of Prussia, a fief of Poland. Königsberg, the capital, became one of the biggest cities and ports of ducal Prussia, having considerable autonomy, a separate parliament and currency, and with German as its dominant language. The city flourished through the export of wheat, timber, hemp, and furs, as well as pitch, tar, and ash. 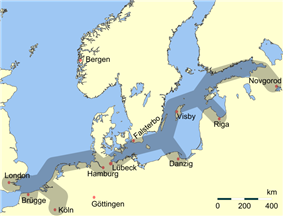 Königsberg was one of the few Baltic ports regularly visited by more than one hundred ships annually in the latter 16th century, along with Danzig and Riga. The University of Königsberg, founded by Albert in 1544, became a centre of Protestant teaching. The capable Duke Albert was succeeded by his feeble minded son, Albert Frederick. Anna, daughter of Albert Frederick, married Elector John Sigismund of Brandenburg, who was granted the right of succession to Prussia on Albert Frederick's death in 1618. From this time the Electors of Brandenburg, the rulers of Brandenburg-Prussia, governed the Duchy of Prussia and Königsberg. When Imperial and then Swedish armies overran Brandenburg during the Thirty Years' War of 1618-1648, the Hohenzollern court fled to Königsberg. On 1 November 1641, Elector Frederick William persuaded the Prussian diet to accept an excise tax. In the Treaty of Königsberg of January 1656, the elector recognized his Duchy of Prussia as a fief of Sweden. In the Treaty of Wehlau in 1657, however, he negotiated the release of Prussia from Polish sovereignty in return for an alliance with Poland. 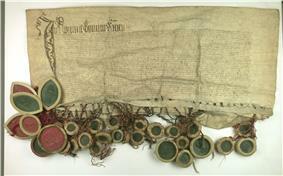 The 1660 Treaty of Oliva confirmed Prussian independence from both Poland and Sweden. In 1661 Frederick William informed the Prussian diet that he possessed jus supremi et absoluti domini, and that the Prussian Landtag could convene with his permission. The Königsberg burghers, led by Hieronymus Roth of Kneiphof, opposed "the Great Elector's" absolutist claims, and actively rejected the Treaties of Wehlau and Oliva, seeing Prussia as "indisputably contained within the territory of the Polish Crown". Delegations from the city's burghers went to the Polish king, Jan Kazimierz, who initially promised aid, but then failed to follow through. The townspeople attacked the elector's troops while local Lutheran priests held masses for the Polish king and for the Polish-Lithuanian Commonwealth. However, Frederick William succeeded in imposing his authority after arriving with 3,000 troops in October 1662 and training his artillery on the town. Refusing to request mercy, Roth went to prison in Peitz until his death in 1678. The Prussian estates which swore fealty to Frederick William in Königsberg on October 18, 1663 refused the elector's requests for military funding, and Colonel Christian Ludwig von Kalckstein sought assistance from neighboring Poland. After the elector's agents had abducted Kalckstein, he was executed in 1672. The Prussian estates' submission to Frederick William followed; in 1673 and 1674 the elector received taxes not granted by the estates and Königsberg received a garrison without the estates' consent. The economic and political weakening of Königsberg strengthened the power of the Junker nobility within Prussia. By the act of coronation in Königsberg Castle on January 18, 1701, Frederick William's son, Elector Frederick III, became Frederick I, King in Prussia. The elevation of the Duchy of Prussia to the Kingdom of Prussia was possible because the Hohenzollerns' authority in Prussia was independent of Poland and the Holy Roman Empire. Since "Kingdom of Prussia" was increasingly used to designate all of the Hohenzollern lands, former ducal Prussia became known as the Province of Prussia (1701–1773), with Königsberg as its capital. 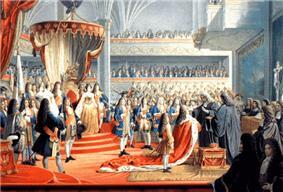 However, Berlin and Potsdam in Brandenburg were the main residences of the Prussian kings. The city was wracked by plague and other illnesses from September 1709 to April 1710, losing 9,368 people, or roughly a quarter of its populace. 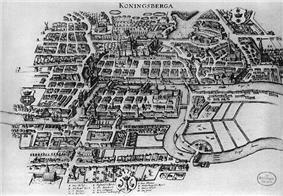 On June 13, 1724, Altstadt, Kneiphof, and Löbenicht amalgamated to formally create the larger city Königsberg. Suburbs that subsequently were annexed to Königsberg include Sackheim, Rossgarten, and Tragheim. During the Seven Years' War Imperial Russian troops occupied eastern Prussia at the beginning of 1758 . 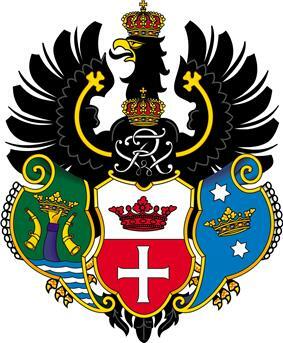 On December 31, 1757, Empress Elizabeth I of Russia issued an ukase about the incorporation of Königsberg into Russia. On January 24, 1758, the leading burghers of Königsberg submitted to Elizabeth. Five Imperial Russian general-governors administered the city during the war from 1758–62; they included William Fermor and Nikolaus Friedrich von Korff. With the end of the Seven Years' War the Russian army abandoned the town in 1763. After Prussia's defeat at the hands of Convention of Tauroggen. The extensive Prussian Eastern Railway linked the city to Breslau, Thorn, Insterburg, Eydtkuhnen, Tilsit, and Pillau. In 1860 the railway connecting Berlin with St. Petersburg was completed and increased Königsberg's commerce. Extensive electric tramways were in operation by 1900; and regular steamers plied to Memel, Tapiau and Labiau, Cranz, Tilsit, and Danzig. The completion of a canal to Pillau in 1901 increased the trade of Russian grain in Königsberg, but, like much of eastern Germany, the city's economy was generally in decline. By 1900 the city's population had grown to 188,000, with a 9,000-strong military garrison. 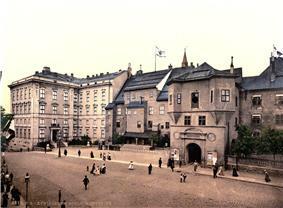 By 1914 Königsberg had a population of 246,000; Jews flourished in the culturally pluralistic city. Following the defeat of the Central Powers in World War I, Imperial Germany was replaced with the democratic Weimar Republic. The Kingdom of Prussia ended with the abdication of the Hohenzollern monarch, William, and the kingdom was succeeded by the Free State of Prussia. 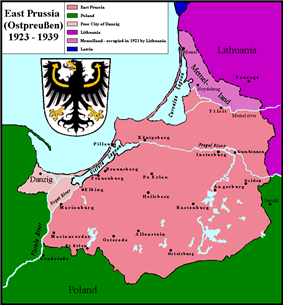 Königsberg and East Prussia, however, were separated from the rest of Weimar Germany by the creation of the Polish Corridor. In 1925, Josef Nadler became professor at Königsberg university. In 1930 Nazis demolished Jewish shops and, like all over Germany, a "aryanization" of the civil service Jewish academics were thrown out of the university. In 1932 the local paramilitary SA had already started to terrorise their political opponents. On the night of 31 July 1932 there was a bomb attack on the headquarters of the Social Democrats in Königsberg, the Otto-Braun-House. The Communist politician Gustav Sauf was killed, the executive editor of the Social Democrat "Königsberger Volkszeitung", Otto Wyrgatsch, and the German People's Party politician Max von Bahrfeldt were severely injured. Members of the Reichsbanner were attacked and the local Reichsbanner Chairman of Lötzen, Kurt Kotzan, was murdered on 6 August 1932. On July 1934 Adolf Hitler made a speech in the city, gathering 25,000 supporters In 1933 NSDAP alone received 54% of votes in the city After the Nazis took power in Germany, opposition politicians were persecuted and newspapers were banned. The Otto-Braun-House was requisitioned and became the headquarters of the SA, that used the house to imprison and torture opponents. Walter Schütz, a communist member of the Reichstag was murdered here. Many who would not cooperate with the rulers of Nazi Germany were sent to concentration camps and held prisoner there until their death or liberation. Prior to the Nazi era, Königsberg was home to a third of East Prussia's 13,000 Jews. The city's Jewish population shrank from 3,200 in 1933 to 2,100 in October 1938. The New Synagogue of Königsberg, constructed in 1896, was destroyed during Kristallnacht (November 9, 1938); 500 Jews soon fled the city. In 1941, in his Literaturgeschichte des Deutsche Volkes Prof. Josef Nadler justified the removal of Jews from the German Volksraum. 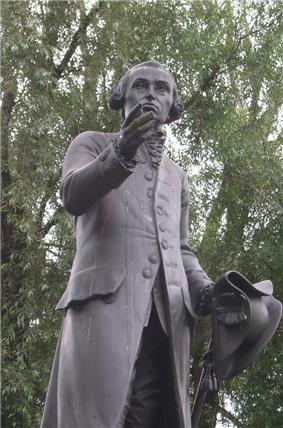 Shortly thereafter, the city of Königsberg awarded him with its Kant Preis. In September 1939 with the German invasion against Poland ongoing, the Polish consulate in Königsberg was attacked (which constituted a violation of international law), its workers arrested and sent to concentration camps where several of them died. Polish students from local university were captured, tortured and finally executed. Other victims included local Polish civilians guillotined for petty violations of Nazi law and regulations such as buying and selling meat. In September 1944 there were 69,000 slave labourers registered in the city(not counting prisoners of war), with most of them working on the outskirts; within the city itself 15,000 slave labourers were located. All of them were denied freedom of movement, forced to wear "P" sign if Poles, or "Ost" sign if they were from Soviet Union and were watched by special units of Gestapo and Wehrmacht. They were denied basic spiritual and physical needs and food, and suffered from famine and exhaustion. The conditions of the forced labour were described as "tragic", especially Poles and Russians, who were treated especially harshly by their German overseers. Ordered to paint German ships with toxic paints and chemicals, they were neither given gas-masks nor was there any ventilation in facilities where they worked, in order to speed up the construction of the ships, while the substances evaporated in temperatures as low as 40 Celsius. As a result, there were cases of sudden illness or death during the work. In 1944, Königsberg suffered heavy damage from British bombing attacks and burned for several days. The historic city centre, especially the original quarters Altstadt, Löbenicht, and Kneiphof, was destroyed, including the cathedral, the castle, all churches of the old city, the old and the new universities, and the old shipping quarters. Many people fled from Königsberg ahead of the Red Army's advance after October 1944, particularly after word spread of the Soviet atrocities at Nemmersdorf. In early 1945, Soviet forces, under the command of the Polish-born Soviet Marshal Konstantin Rokossovsky, besieged the city that Hitler had envisaged as the home for a museum holding all the Germans had 'found in Russia'. In Operation Samland, General Baghramyan's 1st Baltic Front, now known as the Samland Group, captured Königsberg in April. Although Hitler had declared Königsberg an "invincible bastion of German spirit", the Soviets captured the city after three-month-long siege. 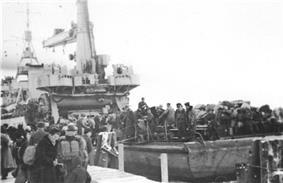 A temporary German breakout had allowed some of the remaining civilians to escape via train and naval evacuation from the nearby port of Pillau. Königsberg, which had been declared a "fortress" (Festung) by the Germans, was fanatically defended. On 21 January, during the Red Army's East Prussian Offensive, mostly Polish and Hungarian Jews from Seerappen, Jesau, Heiligenbeil, Schippenbeil, and Gerdauen (subcamps of Stutthof concentration camp) were gathered in Königsberg. Up to 7,000 of them were forced on a death march to Sambia: those that survived being subsequently executed at Palmnicken. On April 9 — one month before the end of the war in Europe — the German military commander of Königsberg, General Otto Lasch, surrendered the remnants of his forces, following the three-month-long siege by the Red Army. For this act, Lasch was condemned to death, in absentia, by Hitler. At the time of the surrender, military and civilian dead in the city were estimated at 42,000, with the Red Army claiming over 90,000 prisoners. Lasch's subterranean command bunker was preserved as a museum in today's Kaliningrad. About 120,000 survivors remained in the ruins of the devastated city. These survivors, mainly women, children and the elderly, plus a few others who had returned immediately after the fighting ended, were held as slave labourers until 1949. The vast majority of the German civilians left in Königsberg after 1945, died from disease or deliberate starvation, or in revenge-driven ethnic cleansing. The remaining 20,000 German residents were expelled in 1949–50. In 1945, at the end of World War II, when the city was captured by the Soviet Union, it became part of the Russian SFSR as agreed to by the Allies at the Potsdam Conference. 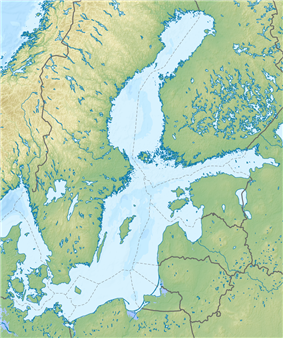 In 1946 the city's name was changed to Kaliningrad. The vast majority of the population belonged to the Lutheran Church and other Protestant denominations. The Jewish community in the city had its origins in the 16th century, with the arrival of the first Jews in 1538. The first synagogue was built in 1756. A second, smaller synagogue which serviced Orthodox Jews was constructed later. The number of Jewish inhabitants peaked in 1880 at about 5,000, many of whom were migrants escaping pogroms in the Russian empire. This number declined subsequently so that by 1933, when the Nazis took over, the city had about 3,200 Jews. As a result of anti-semitism and persecution in the 1920s and 1930s two thirds of the city's Jews emigrated, mostly to the US and Great Britain. Those who remained were shipped by the Germans to concentration camps in two waves; first in 1938 to various camps in Germany, and the second in 1942 to the Theresienstadt concentration camp in occupied Czechoslovakia, Kaiserwald concentration camp in occupied Latvia, as well as camps in Minsk in occupied Byelorussian Soviet Socialist Republic. University of Königsberg was an important center of Protestant Lithuanian culture and studies. Abraomas Kulvietis and Stanislovas Rapalionis are also seen as important early Lithuanian scholars. Daniel Klein published the first Lithuanian grammar book in Königsberg in 1653. Poles were among the first professors of the University of Königsberg, which received the royal Law of Privilege from king Sigismund II Augustus of Poland on 28 March 1560. According to Edwin Franciszek Kozłowski: "Polish foundation, Polish culture and Polish heritage lies at the heart of the University of Königsberg, college, made famous by Immanuel Kant, and its name derives from Alberite Prince Albrecht, the Polish faithful vassal." University of Königsberg lecturers included Hieronim Malecki (theology), Maciej Menius (astronomy) and Jan Mikulicz-Radecki (medicine). Jan Kochanowski and Stanislaw Sarnicki were among the first students known to be Polish, later Florian Ceynowa, Wojciech Kętrzynski and Julian Klaczko studied in Königsberg. For 24 years Celestyn Myślenta (who first registered at the University as "Polonus") was a seven time rector of the university, while Maciej Menius was a three times rector. From 1728 there was a "Polish Seminar" at the seminary of Protestant theology, which operated until the early 1930s and had developed a number of pastors, including Christoph Mrongovius and August Grzybowski. Duke Albert of Prussia established a press in Königsberg that issued thousands of Polish pamphlets and religious books. During the Reformation Königsberg became a place of refuge for Polish Protestant adherents, a training ground for Polish Protestant clergy and a source of Polish Protestant literature. In 1564 Jan Mączyński issued his Polish-Latin lexicon at Königsberg. According to historian Janusz Jasiński, based on estimates obtained from the records of St. Nicholas's Church, during the 1530s Lutheran Poles constituted about one quarter of the city population. This does not include Polish Catholics or Calvinists who did not have centralized places of worship until the 17th century, hence records that far back for these two groups are not available. From the 16th to 20th centuries, the city was a publishing center of Polish-language religious literature. In 1545 in Königsberg a Polish catechism was printed by Jan Seklucjan. In 1551 the first translation of the New Testament in Polish language came out, issued by Stanisław Murzynowski. Murzynowski's collections of sermons were delivered by Eustachy Trepka and in 1574 by Hieronim Malecki. The works of Mikolaj Rej were printed here by Seklucjan. Maciej Stryjkowski announced in Königsberg the publication of his Kronika Polska, Litewska, Żmudzka, i wszystkiej Rusi ("A Chronicle of Poland, Lithuania, Samogitia and all Rus"). Although formally the relationship of these lands with Poland stopped at the end of the 17th century, in practice the Polish element in Königsberg played a significant role for the next century, until the outbreak of World War II. Before the second half of the 19th century many municipal institutions (e.g. courts, magistrates) employed Polish translators, and there was a course in the Polish language at the university. Polish books were issued as well as magazines with the last one being the Kalendarz Staropruski Ewangelicki (Old Prussian Evangelical Calendar) issued between 1866 to 1931. Königsberg was the birthplace of the mathematician Christian Goldbach and the writer E.T.A. Hoffmann, as well as the home of the philosopher Immanuel Kant, who lived there all his life and never travelled more than ten miles (16 km) away from the city. Kant entered the university of Königsberg at age 16 and was appointed to a chair in metaphysics there in 1770 at the age of 46. While working there he published his Critique of Pure Reason (arguing that knowledge arises from the application of innate concepts to sensory experience) and his Metaphysics of Morals which argues that virtue is acquired by the performance of duty for its own sake. In 1736, the mathematician Leonhard Euler used the arrangement of the city's bridges and islands as the basis for the Seven Bridges of Königsberg Problem, which led to the mathematical branches of topology and graph theory. 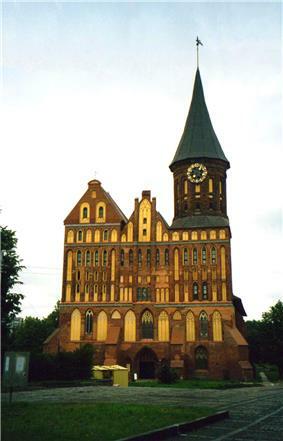 In the 19th century Königsberg was the birthplace of the influential mathematician David Hilbert. The dialect spoken by most citizens was Low Prussian, now a moribund language as its refugee speakers are elderly and dying out. In the Königsstraße (King Street) stood the Academy of Art with a collection of over 400 paintings. About 50 works were by Italian masters; some early Dutch paintings were also to be found there. At the Königstor (King's Gate) stood statues of King Ottakar I of Bohemia, Albert of Prussia, and Frederick I of Prussia. Königsberg had a magnificent Exchange (completed in 1875) with fine views of the harbor from the staircase. Along Bahnhofsstraße ("Railway Street") were the offices of the famous Royal Amber Works — Samland was celebrated as the "Amber Coast". There was also an observatory fitted up by the astronomer Friedrich Bessel, a botanical garden, and a zoological museum. The "Physikalisch", near the Heumarkt, contained botanical and anthropological collections and prehistoric antiquities. Two large theatres built during the Wilhelmine era were the Stadt (city) Theatre and the Appollo. As a consequence of the Protestant Reformation, the 1525 and subsequent Prussian church orders called for providing religious literature in the languages spoken by the recipients. Duke Albrecht thus called in a Danzig (Gdańsk) book printer, Hans Weinreich, who was soon joined by other book printers, to publish Lutheran literature not only in German and (New) Latin, but also in Latvian, Lithuanian, Old Prussian and Polish. The expected audience were inhabitants of the duchy, religious refugees, Lutherans in neighboring Ermland (Warmia), Lithuania, and Poland as well as Lutheran priests from Poland and Lithuania called in by the duke. Königsberg thus became a center of printing German- and other language books: In 1530, the first Polish translation of Luther's Small Catechism was published by Weinrich. In 1545, Weinreich published two Old Prussian editions of the catechism, which are the oldest printed and second-oldest books in that language after the handwritten 14th century "Elbing dictionary". The first Lithuanian-language book, Catechismvsa prasty szadei, makslas skaitima raschta yr giesmes by Martynas Mažvydas, was also printed in Königsberg, published by Weinreich in 1547. Further Polish- and Lithuanian-language religious and non-religious prints followed. One of the first newspapers in Polish language was published in Königsberg in the years 1718-1720 Poczta Królewiecka. Königsberg was well-known within Germany for its unique regional cuisine. A popular dish from the city was Königsberger Klopse, which is still made today in some specialty restaurants in Kaliningrad and present-day Germany. The fortifications of the former East Prussian capital Königsberg (now Kaliningrad) consist of numerous defensive walls, forts, bastions and other structures. They make up the First and the Second Defensive Belt, built in 1626—1634 and 1843—1859, respectively. The 15 metre-thick First Belt was erected due to Königsberg's vulnerability during the Polish–Swedish wars. The Second Belt was largely constructed on the place of the first one, which was in a bad condition. The new belt included twelve bastions, three ravelins, seven spoil banks and two fortresses, surrounded by water moat. Ten brick gates served as entrances and passages through defensive lines and were equipped with moveable bridges. Gause, Fritz: Die Geschichte der Stadt Königsberg in Preußen. Three volumes, Böhlau, Cologne 1996, ISBN 3-412-08896-X (German). ^ Meyers Konversations-Lexikon. 6th edition, vol. 11, Leipzig and Vienna 1908, p. 387 (German). ^ Gemeindelexikon für das Königreich Preußen. Heft 1, Verlag des Königlichen Statistischen Landesamtes, Berlin 1907, p. 118 + 119 (German). ^ Der Große Brockhaus, 15th edition, vol. 10 (Leipzig 1931), p. 382 (German).